Festivus is a secular holiday celebrated on 23 December as a way to celebrate the holiday season without participating in its pressures and commercialism. It was created by writer Dan O'Keefe and introduced into popular culture by his son Daniel, a screenwriter for the 166th episode of Seinfeld, The Strike (18 December 1997). In the 13 years since Festivus was introduced on an episode of "Seinfeld," the made-up Dec. 23 "holiday for the rest of us" has moved well beyond the confines of American TV reruns to become globally recognized. While mostly noted today among Americans, Festivus was also inspiring a number of tweets from around the world and for much of the day was a top 10 most-tweeted phrase among tweeters worldwide. He was interested in ceremony, ritual, magic and religion … He wanted a holiday mostly that wasn't political or religious in nature, but based on family. … It was very different from the TV holiday … We streamlined it for laughs. … In reality it could happen any damn time of the year, and that's what made it so terrifying. Actually I didn't want to put it on TV. It was sort of a family disgrace, and then my younger brother let it slip that this went on, so the other writers and Jerry said, yeah, "we'd like to give this to America." I said I don't think America wants it at all or should have it, but they prevailed upon me and now the chicken's have come home to roost. … The real symbol of the holiday was a clock my dad put in a bag and nailed to the wall every year … I don't know why, I don't know what it means, he would never tell me. He would always say, "That's not for you to know." So I honestly don’t know what it signifies. The actual inventor of Festivus is Dan O'Keefe, 76, whose son Daniel, a writer on "Seinfeld," appropriated a family tradition for the episode. The elder Mr. O'Keefe was stunned to hear that the holiday, which he minted in 1966, is catching on. "Have we accidentally invented a cult?" he wondered. To postulate grandly, the rise of Festivus, a bare-bones affair in which even tinsel is forbidden, may mean that Americans are fed up with the commercialism of the December holidays and are yearning for something simpler. The holiday evolved during the 1970's, when the elder Mr. O'Keefe began doing research for his book "Stolen Lightning" (Vintage 1983), a work of sociology that explores the ways people use cults, astrology and the paranormal as a defense against social pressures. Festivus, with classic rituals like familial gatherings, totemic-but-mysterious objects and respect for ancestors, slouched forth from this milieu. "In the background was Durkheim's Elementary Forms of Religious Life," Mr. O'Keefe recalled, "saying that religion is the unconscious projection of the group. And then the American philosopher Josiah Royce: religion is the worship of the beloved community." 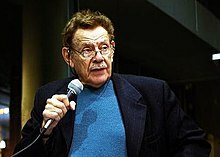 If Mr. O'Keefe is the real father of Festivus, Jerry Stiller, the actor who played Frank Costanza, George Costanza's father, is its Santa Claus. There was no Christ yet, no Yahweh, no Buddha. There were great ruins and raw nature. But there was a kindling spark of hope among men. They celebrated that great thunderous storms hadn't enveloped them in the past year, that landslides hadn't destroyed them. They made wishes that their crops would grow in the fields, that they'd have food the next year and the wild animals wouldn't attack and eat them. In its purest form, Festivus is truly the people's holiday, one that they own, unfettered by rules, leaders, miles of wrapping paper, bubble lights and — most of all — the dreaded tinsel. "Festivus is completely flexible. There's no ruling force telling you what to do. Nobody owns it. And, it's cheap," says Allen Salkin, explaining the appeal of a holiday that is intentionally low-key, sarcastic and, well, basically anything else you'd like it to be. Many Christmases ago, I went to buy a doll for my son. I reach for the last one they had — but so did another man. As I rained blows upon him, I realized there had to be another way! … out of that, a new holiday was born. "A Festivus for the rest of us!" Elaine: What is it? "Dear son, Happy Festivus." 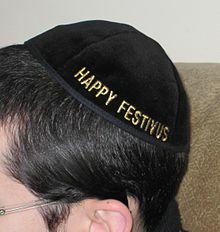 What is Festivus? George: It's nothing, stop it..
Jerry: When George was growing up..
Jerry: Hated all the commercial and religious aspects of Christmas, so he made up his own holiday. Elaine: Ohhhh — and another piece of the puzzle falls into place. Jerry:: When George was growing up..
George: Stop it! It's nothing. It's a stupid holiday my father invented. It doesn't exist! Kramer: Frank invented a holiday? He's so prolific! Frank: And at the Festivus dinner, you gather your family around, and you tell them all the ways they have disappointed you over the past year. Kramer: Is there a tree? Frank: No. Instead, there's a pole. Requires no decoration. I find tinsel distracting. Frank: Let's do it then! Festivus is back! I'll get the pole out of the crawl space. Frank: Welcome, newcomers. The tradition of Festivus begins with the airing of grievances. I got a lot of problems with you people! And now you're gonna hear about it! This page was last edited on 22 December 2017, at 22:06.